It is not in the secluded wastes of Nature but before a large audience that the equally precarious activities of the “castellers” are performed. In the course of large fiestas these Spanish athletic groups compete with one another to form the highest tower (“castell”) composed of people with the ever-imminent risk that the human pyramid could end up collapsing like a house of cards, bringing all the participants tumbling down. Footage from a TV documentary about such casteller groups formed the basis for a work that Eva Teppe titled with the Wittgenstein quote Die Welt ist alles, was der Fall ist (The world is everything that is the case). 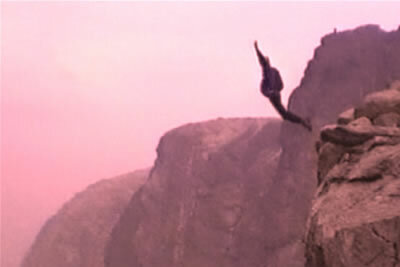 As in her base jumper films, the deceleration of the sequence of movements strips this action of its immediate physical impact. The falling bodies and the stark enlargement of the original material engender an abstracted flow of colour, which in such extreme close-up makes the viewer feel as if he himself were caught in the midst of the action. At the same time the images convey a diffuse sense of menace far in excess of the rashness of undertaking the self-chosen risk of this well-rehearsed ritual. (Text: Ludwig Seyfarth. Excerpt from the catalogue “LONG VIEW”).